More than a million people are fleeing the Carolina coast ahead of Hurricane Florence’s impending landfall. When they return, the region they call home will likely be forever changed. Hurricane Florence is an almost impossibly rare threat. A storm this powerful is exceedingly rare this far north on the East Coast. Never before has a hurricane threatened the East Coast with nearly four feet of rainfall. In just two cases since our records began in 1851 — Hazel in 1954 and Hugo in 1989 — has a Carolina hurricane provoked an 18-foot rise in the ocean tide. In my two decades as a meteorologist, I can’t recall a single storm that threatened new all-time records in all three of these, simultaneously, anywhere in the world. Despite what some of my more hesitant colleagues might say, you can connect individual weather events to climate change in this day and age. Quite simply, Hurricane Florence is a storm made worse by climate change. A warmer atmosphere can hold more water vapor — producing heavier downpours and providing more energy to hurricanes, boosting their destructive potential. We already have evidence of these trends from around the world. This is no longer just a theory. The Carolinas are likely to join Texas, Florida, Puerto Rico, California and countless other places worldwide that have experienced such deadly weather over the past 12 months. 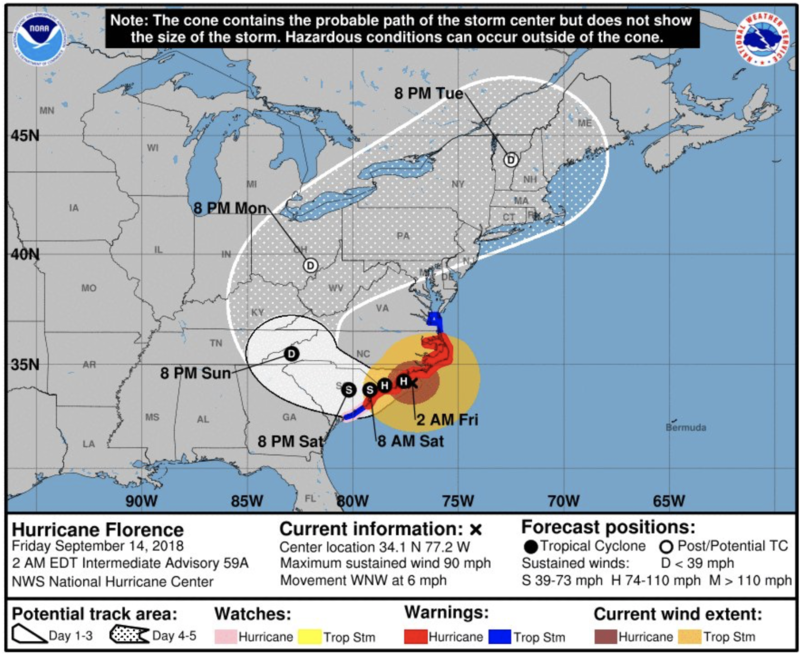 On Tuesday, the U.S. Geological Survey issued a statement predicting that Florence could erode away protective dunes from three-quarters of North Carolina’s beaches. Like the otherworldly wildfire smoke that dimmed the British Columbia sun last month or the clear-day floods that routinely hit the Marshall Islands, this week’s potentially coastline-erasing landfall is a glimpse into a haunting world that has arrived too soon.